I am always on the lookout for a quick and easy stitch. 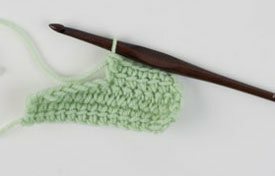 In last winter's issue of Interweave Crochet I was reintroduced to the linked double crochet stitch. This is easily one of my favorite stitches. 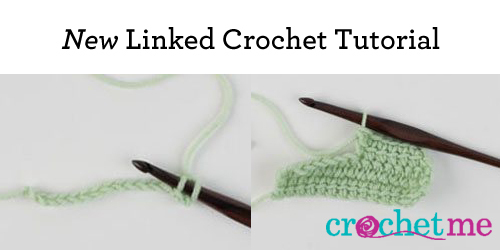 Fast and simple, the linked double crochet stitch combines the speed and height of taller stitches, such as the double or triple crochet, with the solid fabric generally associated with single crochet. With each issue of Interweave Crochet, I look forward to the in-depth how-to technique articles, the innovative crochet patterns, the quick and easy accessories, and so much more. Sometimes the stitches or techniques are brand new to me, and sometimes they are a pleasant reminder of what can be accomplished with crochet. Work the beginning chain as normal. Work the first row of stitches by inserting your hook in the second chain from the hook, yarn over and pull up a loop. 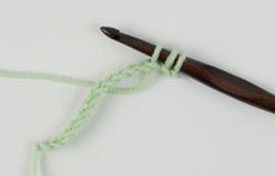 The loop you have just pulled up takes the place of the yarnover in a regular double crochet but does not create the "space" normally associated with a yarnover. Insert your hook in the next foundation chain, yarn over and pull up a loop. 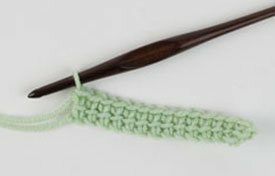 You will now have three loops on your hook, just as you would for a normal double crochet. To finish the stitch, simply work as you would a normal double crochet, yarn over and draw through two loops twice. Notice the horizontal bar created on the post of the stitch. 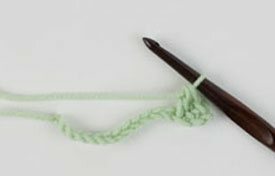 To work subsequent linked double crochets, insert your hook from top to bottom behind the horizontal bar on the post of the stitch you just worked. This horizontal bar runs parallel to the front loop at the top of the stitch. Yarn over and pull up a loop through the bar. Insert your hook in the next chain; yarn over and pull up a loop. Work these loops off as before. Repeat this stitch to the end of the row. 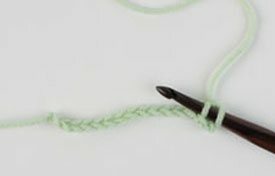 For successive rows, chain two to equal the height of the double crochet row, insert your hook in the second chain and pull up a loop. Insert your hook in the next stitch as usual, and work the loops off of the hook as before. Work the remainder of the row as above. See, it's easy! Notice how the fabric is solid, without the tiny gaps between stitches, making it perfect for quick projects. As your piece gets bigger, you will really begin to notice the gorgeous drape as well. You can experiment with inserting a row of lacier stitches between the linked stitches rows. 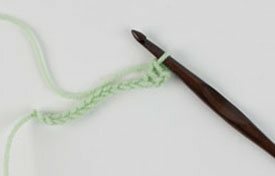 Subscribe to Interweave Crochet today, and begin exploring a variety of helpful techniques and stitches as well as other valuable articles and extraordinary patterns in Tunisian crochet, lace, linked crochet, and more to expand your skills. P.S. What crochet stitch would you like to see more patterns in?